I’ve always appreciated when my kids were given books as gifts. Books don’t require batteries. They travel well. And they don’t have any tiny pieces that can get lost or inadvertently stepped on. Many book givers share their kids’ favorites, so they’re already vetted when you sit down to read them for the first time. A few of the books we received when my kids were babies included “Good Dog, Carl” and “Goodnight, Gorilla.” I’ll confess to feeling a bit confused about these books. They have zero words! There’s so much emphasis on reading to your kids, so how could these books really be reading? Well, we sat down and “read” these books, and not surprisingly, they became our favorites too. Not only do wordless picture books allow you to exercise your creative muscle, they provide many receptive and expressive language opportunities as well. In speech therapy, we use wordless picture books to target vocabulary-building, narrative development, story retell, sequencing and temporal terms, describing, prediction and inference, perspective-taking and reading nonverbals, answering wh-questions, and so much more. Be sure to let us know your favorites as well! Many of these books feature beautifully colorful illustrations and animal characters. Tying into Valentine’s Day, we’re making heart animals as our February clinic craft. 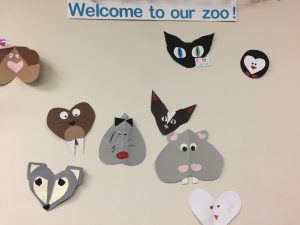 Feel free to craft your favorite animal character and add it to our zoo wall.